How do they work? Or do they work at all? Try to go upstairs…or try to go downstairs. Or heck, try to get off of the stairs! Penrose stairs are named after a father and son who have the last name of Penrose. (The stairs have nothing else to do with pens or flowers.) It was designed by them as an impossible staircase, or an endless staircase. Luckily for them, artist M.C. Escher learned of their drawing and he went on to draw a famous version of the staircase. 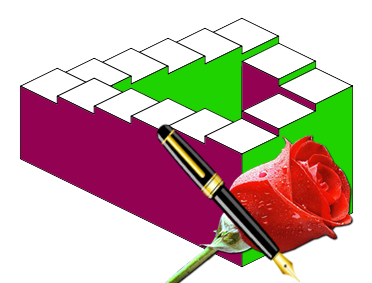 A fun video that illustrates the Penrose stairs is here. It is pretty clever to come up with an impossible structure. A building with inside walls on the outside maybe?